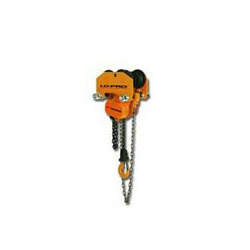 Backed by our rich industrial experience in this domain, we are devotedly engaged in offering supreme quality Motorized Chain Pulley Block that is used extensively for material handling during construction. Our given pulley block is manufactured using best quality material under the direction of vendor’s skilled professionals. This pulley block is obtainable in numerous specifications as per the requirements of clientele. Offered pulley block is used for heavy-duty applications. We, Macnum Engineers, started our operation in the year 2005, are known for supplying, wholesaling, trading and retailing a wide range of the premium quality of Pneumatic & Crimping Tools. The product range offer by us is inclusive of Pneumatic Tools, Air Tapper & Riveter and Crimping Tools – NILE. For ensuring high standards of quality, the offered Pneumatic & Crimping Tools are procured from trusted and reliable vendors of the industry. Manufactured as per the industry set norms and regulations at the vendors’ end, these pneumatic & crimping tools are known for their rich features such as sturdy construction, compact design, easy operation, low power consumption and minimum maintenance. Utilizing the skills and knowledge of our trained and experienced professionals, we have been able to cater to the precise needs of our valuable customers in the most efficient manner. To meet the precise needs of our valuable customers in the most efficient manner, we have made strong association with some of the most trusted vendors of the industry.